April 2011 - TSP S.r.l. ZCONV485 is an efficient and compact RS232 – RS485 self-powered converter. 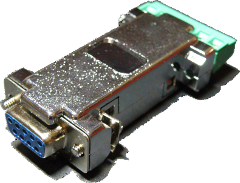 It connects directly to the RS232 port using the classic 9-pin SUBD connector. From this it derives also the current necessary for its operation. On the opposite side there are 6 terminals with a 5.08 mm pitch to which the RS485 communication cable is to be connected. It is also possible to supply the converter directly from the bus by applying a voltage between 9 and 24 Vdc. The following table shows the pinouts of the two connectors. More information? Please use the following form.